The Santa Monica Pier is the only true amusement pier left in Southern California. It is one of the most recognizable landmarks in the Los Angeles area, having played a role in almost every TV show and movie that takes place in LA. Located where Colorado Avenue runs into Ocean Avenue at Santa Monica Beach in the city of Santa Monica in Los Angeles County, the pier is free to visit and open 365 days a year. Colorado Avenue in Santa Monica runs right onto the Santa Monica Pier. How long you spend at Santa Monica Pier depends on what you want to do while you're there. You can plan 15 minutes to look and leave, an hour to walk around, check out the views and maybe buy a few souvenirs or grab an old-fashioned soda. You could also spend the whole day on and around the pier if you ride the rides, play in the arcade, visit the aquarium, fish, rent a bike, have your caricature drawn, stay for dinner and dancing or take in a summer concert or movie. On summer weekends, the pier gets really busy, so you might spend more time waiting in lines. 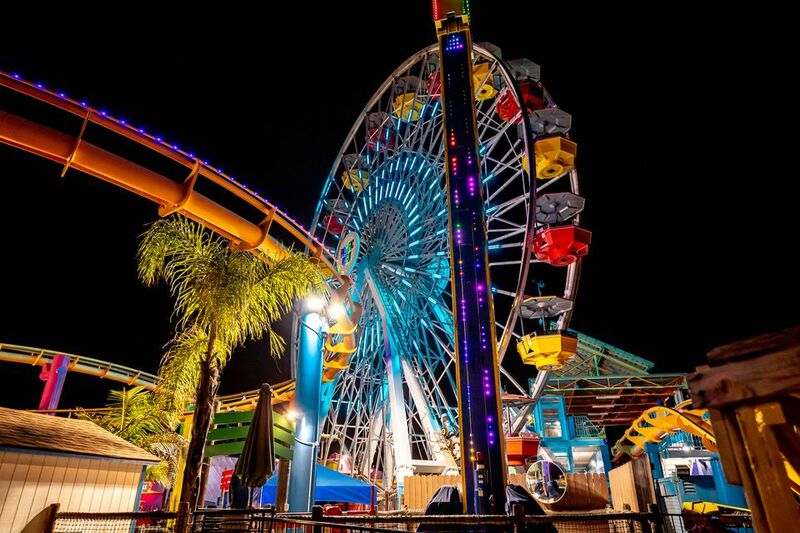 Most of the rides and games on the Santa Monica Pier are part of Pacific Park, a no-admission-fee amusement park with a dozen rides including the famous Ferris Wheel, midway games, and climbing, spinning, and jumping activities. You can pay by the ride, or get an unlimited ride wristband. The Santa Monica Pier Carousel, inside the Carousel Building, is not part of Pacific Park. The current historic merry-go-round, built in 1922, is the 3rd carousel at this location. It has been on the pier since 1947. The Playland Arcade is the oldest continually operating business on the pier. It has a combination of modern video games and nostalgic arcade games. Santa Monica Pier Aquarium is a small aquarium at beach level underneath the pier. It is the education center of HealtheBay.org. The Aquarium is only open to the public a few hours in the afternoons and is closed Mondays. It is located directly under the Carousel Building. It shouldn't be confused with the Aquarium of the Pacific, located in Long Beach. Trapeze School, a branch of Trapeze School New York, offers open-air trapeze lessons and classes, as well as a few other aerial skills, right in the middle of the Santa Monica Pier. Even if you're not brave enough to take a lesson and "fly through the air with the greatest of ease," it's fun to watch. Blazing Saddles is a bike rental shop in the middle of the Santa Monica Pier where you can rent bikes to ride along the bike path. Hours may vary based on the season. There is another bike and skate rental shop, Sea Mist, at the foot of the pier and many other bike rental locations in Santa Monica. Santa Monica Pier Walking Tours - Free 1-hour walking tours of the pier are available from pier docents on Saturdays and Sundays at 11 am and noon. Look for the blue-shirted docents in front of the Pier Shop in the Carousel building before each tour. No reservation required unless you're requesting a private or group tour. Soda Jerk Soda Fountain Tours - There's also a half-hour tour available of Soda Jerks soda fountain in the Carousel building that includes some history on the carousel. The tour fee includes ice cream. Starline Tours on the Santa Monica Pier - Starline Tours has a sales office on the pier, across from Bubba Gump Shrimp Company, where you can buy any of their tour products departing from Santa Monica, Hollywood, or your hotel, depending on the tour. The Santa Monica Pier is also a stop on the Yellow Route of their hop-on-hop-off double-decker bus tour. The Route 66 End of the Trail sign is a popular spot to stop for a selfie, but the sign itself is controversial. The pier is not the actual end of Route 66. Route 66 is Santa Monica Boulevard so it ends where it intersects with Highway 1, which, depending on how you look at it, is at Lincoln Blvd, or at Ocean. The pier was designated as the "official" end of Route 66 during ​its 100th-anniversary celebration in 2009 and this sign was added. It's a replica of a sign that once stood on Ocean at the end of Santa Monica Boulevard. Before the Ferris Wheel starts spinning or the food vendors are open, fishermen and women are casting their rods off the side of Santa Monica Pier, as they have for over 100 years. The guys at Pier Bait & Tackle can rent you a pole, sell you bait and give you the lowdown on what's biting. There are a variety of sit-down and fast food restaurants at the Santa Monica Pier that are relatively reasonably priced for a major tourist attraction with the best sunset view around. Some are more family-friendly, others more of a nightlife experience in the evening. There are a few small shops on the pier where you can pick up a souvenir of your visit, or some last minute beach supplies. There are also a number of souvenir carts. The Carousel Gift Shop is a souvenir and novelty shop inside the Carousel building. Marlene's Beachcomber will let you turn your pier visit into a beach day if you forgot your swimsuit, beach mat or sunscreen. Many a singer/songwriter got their start busking on the Santa Monica Pier. It's a prized permit for all kinds of street performers, so you never know who you'll see. Due to space limitations, you won't find the bigger acrobatic acts that you might see on the Third Street Promenade or at Venice Beach, but you'll see singers, dancers, mimes, magicians, and more. Bring along cash to tip your favorites. If you're a Pokémon Go fan, Santa Monica Pier is a prime spot to find rare Pokémon. The pier and boardwalk have over a dozen lured PokéStops. A lot of Pokémon hunters come out later in the evening when it's not so crowded, but watch out for people glued to their cell phone screens at any time of day. Every summer, the Santa Monica Pier hosts the Twilight Dance Series on Thursday nights, which isn't so much about dancing as bringing cool bands down to the beach. In addition to packing the pier, locals bring out their beach blankets to enjoy the music from the sand on the south side of the pier. The same spot at the southeast corner of the pier, by the parking lot, is used for Movies on the Pier in the early fall.